Taking a short break from the deliciousness to share something a bit more personal. Regularly scheduled recipes will return on Monday! I've never been an exerciser. In fact, my fitness aversion has been a lifelong struggle for me. But late last year, I discovered just the right reinforcement: the Disney World Wine & Dine Half Marathon. Yes, there's more than a bit of running involved, but Disney World? Epcot International Food & Wine Festival? SIGN ME UP! Since then, Andy and I have been taking baby steps, starting with training for a 5k (3.1 miles). I'm excited to share that I finished my first 5k this morning! I've been using the Couch to 5k program, which is a 9-week training course designed for people who have never run before to work up to the 5k distance. In baby steps, which is just my style. There have been hurdles, and it's certainly taken me more than 9 weeks, but I can say with certainty that I never, ever, ever thought I could run, let alone enjoy it, but I can and I do! Our half marathon is in October, so I'll be taking plenty more baby steps until then. I wanted to share this not only to share a little bit more about what's been inspiring me these days, but to let you know that if my exercise aversion sounds familiar to you, it is possible to create new habits. And also to make your insanely large sweet tooth slightly more socially acceptable. I've been writing about my running adventures, both successes and failures, at my running blog, The Happiest Race on Earth (get it? Disneyworld is the Happiest Place on Earth!). If you have any questions about the program (or as always, just want to say hi! ), feel free to leave a comment on this post or shoot me an email (playinghouseamy at gmail.com) and I'll give it my best shot. I'm so not a runner but applaud you! I do want to hear all about DisneyWorld as hubby and I plan to visit there. Go Amy! You're awesome Amy! I cannot wait to see how excited you look after you finish the Disney race =D. I might have to look into couch to 5k, because I'm sick and tired of this couch. so happy you posted this here, and SO proud of you!!! I'm right there with Lauren--I can't wait to see the post-race photo from Disney. Does everyone run with ears? Or are you going to wear a Jasmine headpiece? Congratulations, Amy! I've finally gotten to the point in my running program where I am looking forward to my runs. It's such a strange, but great feeling! good for you, amy--keep it up! Awww yay! I am glad you shared and so excited for you. Running is definitely still something I struggle with mentally, but it's so rewarding in so many ways. I can't wait to hear about Disney! I love this! and YOU!!! Youa re such an inspiration!!! Congrats on the 5K. Much love to you and Andy! 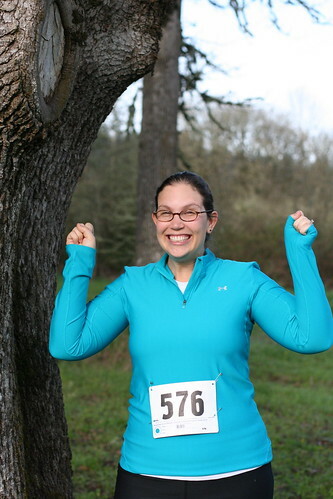 Congrats on your 1st 5K! Congrats on such a wonderful achievement. Great photo! Congrats, Amy!!! That is so amazing! I am proud of you! You have been part of a long string of inspiration to me that has pushed me into a physical exercise program I can stick to! According to your recommendation, I started the Couch-2-5k training and I'm half way through week 4. I have always DESPISED running, but now I LOVE it and look forward to it every other day! I made it 3 miles yesterday! Now I just have to do more running and less walking! Before this program, I was running a mile a day (mostly walking though), and now that's a BREEZE! Thanks for the great recommendation! I knew I could count on you for that! Congrats on your 5k!